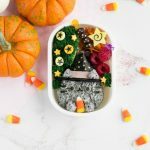 Inspired by Hey Chickadee’s newest Witch Pusheen necklace (which I’m pretty sure I need more than I need air), this Halloween themed bento box is sure to melt even the most callous of Halloween-hater hearts. And if it even has the power to do that, just take a second to imagine the effects it would have on an actual Pusheen and/or Halloween lover. The spells cast by Witch Pusheen are no joking matter, people; you will be irreversibly cursed with an eternity of cuteness (which, let’s be real, is actually a gift from the heavens). Consume at your own risk. Let’s start with magic trick #1: the coffee grinder. The secret ingredient to turning our rice into that iconic grey Pusheen color are finely ground black sesame seeds. So, rather than laboriously grinding away at them in a tiny mortar & pestle, grind them to a near-flawless powder in a coffee grinder. It takes about 5 seconds to complete, and is a HUGE time-saver – a necessity when you’re trying to make a decorative bento box. Believe me, kitchen shortcuts like this are the reason us bento artists aren’t yet extinct, so take full advantage of them! Magic trick #2 – the drinking cup – is going to help us shape the rim of Witch Pusheen’s cute little hat, which is made from a semicircle cutout of cheese. This semicircle can either be formed free-hand (as I did), or by using the base of your chosen drinking cup as a guide (AKA what I should have done). Simply place your cup on the cheese, and cut around it until you have a perfect semicircle; then, just move the cup down about 1 cm and repeat. Done! Just make sure the cup you choose is roughly the same size as Pusheen’s head, to ensure the hat rim fits. One final tip: when cutting out specific shapes from cheese or other soft foods, I always turn to my trusty craft knife. I find it’s the easiest way to get a smooth, precise cut, and I actually use it for A LOT of my bento creations. Don’t sweat it if you don’t have one though; a small paring knife or even a toothpick would also work. I packed the rest of my Witch Pusheen bento box with carrot salad, fresh raspberries, steamed broccoli, and a black bean pick (decorated with edible gold stars). I further decorated it by adding cheese and egg crepe star cutouts, as well as little egg crepe circles topped with nori stars. Keep in mind, when packing an intricate rice design such as Witch Pusheen, it’s always a good idea to use vegetables like broccoli or cherry tomatoes to help fill in the gaps and keep everything in place (for example, I used the broccoli to help keep the witch hat in place). 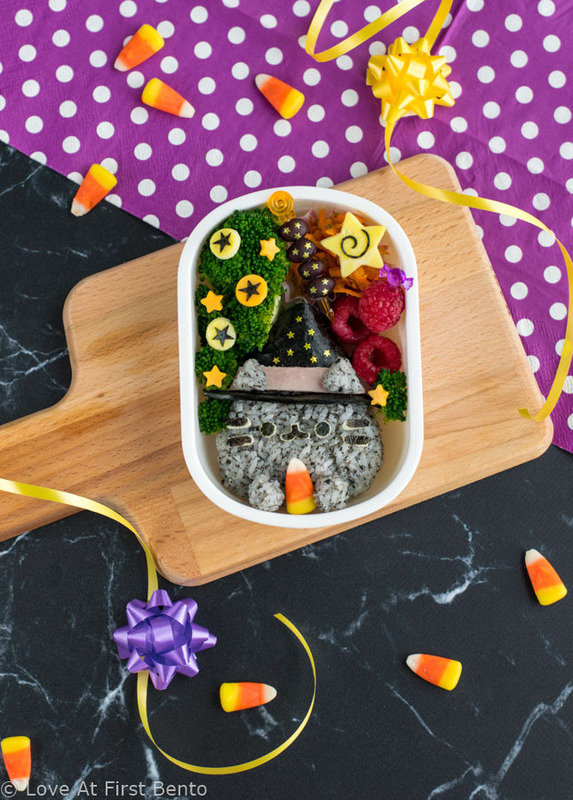 Step-by-step instructions for creating an adorable Witch Pusheen Bento Box. 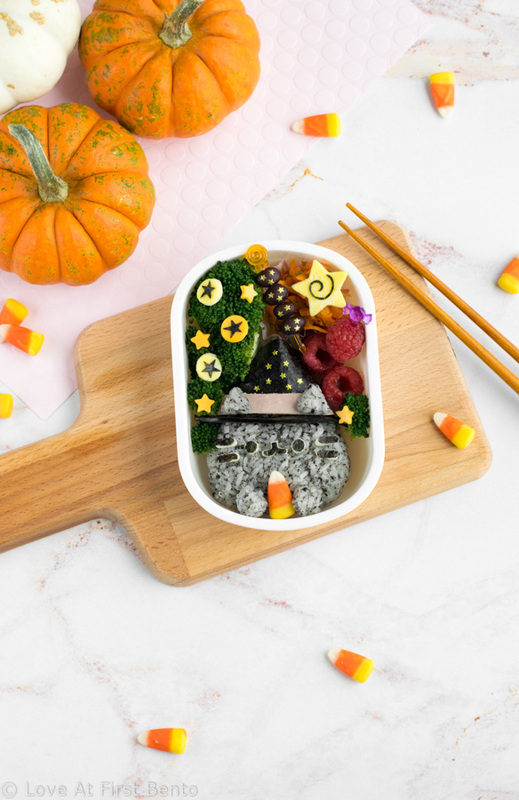 Made from naturally dyed rice + nori, this character bento box is the perfect lunch idea for any Pusheen or Halloween fan. It’s so cute, it’s scary! Using the cat face nori punch, punch out one pair of eyes, 4 whiskers, and 1 mouth. Make sure you punch these out using the rubber mat the kit comes with. With a knife, cut out a thin rectangular strip of ham – this will become the decorative wrap portion of the witch hat. Aim for having it be around 5 cm in length (but this will ultimately depend on how big you make your Pusheen head). 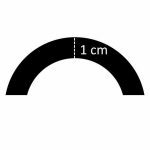 Using a craft knife, paring knife, or toothpick, cut out a semicircle from the white cheese that matches the shape of the diagram pictured below – this will become the rim of the witch hat. Use a drinking cup as a trace to help guide your knife. Take a sheet of nori and cut it into 2 squares that are roughly the same size. Stack both squares on top of each other, then place the white cheese semicircle (from Step 3) on top of the nori stack. Holding both stacks of nori together, carefully cut around the cheese semicircle with scissors, until you end up with two nori semicircles. (One nori semicircle will probably be stuck to the cheese – if so, leave it like that.) Cover both sides of the cheese with the nori semicircles (they should stick with a bit of rubbing). Carefully take the nori/cheese hat rim and, using the black food marker, completely color in the exposed convex edge until there’s no visible white left. Using scissors, cut out a trapezoid shape from the nori (you can use any scrap pieces you may have leftover). This will become the pointy part of the witch hat. Add ground black sesame seeds to warm rice and mix until evenly colored. Feel free to add more ground black sesame if you’d like a darker grey color. To make the head: Add two scoops of grey rice atop a clean sheet of plastic wrap, and wrap completely. Using your hands, mold the rice into an ice cream cone shape (one pointy end, and one rounded end). To shape the round end, place the rice in a cupped hand and gently round out the edges with your fingers and palms. To shape the pointy end, pinch and pull at the rice with your fingers and thumb until a point begins to form. Smooth out all edges as necessary by rubbing with your fingers and against your palms. Take your nori trapezoid, and wrap it around the pointy portion of your rice “head” (the shorter trapezoid end should be at the top) – you should now have the beginning’s of a witch hat, and a circular grey face right underneath. Completely wrap the rice head in a clean sheet of plastic wrap, smoothing down the nori as necessary to ensure it’s fully adhered to the rice. Allow to rest for at least 10 minutes. To make the ears: Add a tiny spoonful of grey rice to a small square of plastic wrap, and wrap completely. Taking your thumb and index finger, pinch & pull at one end of the rice until a point is formed. Press the opposite end into the palm of your hand to create a flattened bottom. Continue shaping and smoothing with your fingers and palms until a small triangle has formed. Repeat this whole process to make the second ear. Keep both ears wrapped in plastic wrap once finished. To make the paws: Add a tiny spoonful of grey rice to a small square of plastic wrap, and wrap completely. Begin forming a tiny ball by squishing the rice together and then rolling it around in the palm of your hand or between your fingers. Once smooth, wrap in plastic wrap and repeat to create a second paw. Place the rice head portion into the bento box you will be using. Using tweezers, place the strip of ham right across the bottom length of the “witch hat”. You may need to cut off the ends of the ham if the strip is too long. To help the ham adhere better, feel free to cover the back with some mayo or honey; another option would be to secure it in place using small pieces of uncooked spaghetti (think of them as “pins”), which will soften from the moisture of the rice by lunchtime. Break off two 1/2 cm pieces of uncooked spaghetti, and stick these carefully into the concave side of your cheese/nori hat rim, making sure to leave a bit of the spaghetti sticking out. Gently insert the hat rim into the rice head, right beneath the ham strip, pushing gently until the spaghetti pieces are fully inserted. Carefully place the rice ears atop the hat rim, near the outside edges. To help them adhere better, insert a small piece of uncooked spaghetti into the back of each ear, and gently push them into the hat portion of the head like you would a pushpin. 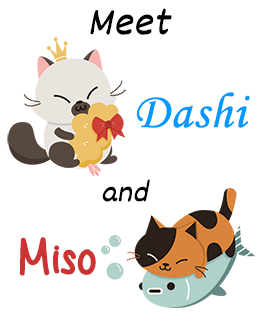 Using tweezers, apply the nori facial features (eyes, mouth, & whiskers) to Pusheen’s face. Feel free to use some mayo or honey to help them stick better. Use a picture of Pusheen as a guide for more exact facial feature placement. Place the 2 rice paws at the very bottom of Pusheen’s face (they can even rest against the edge of the bento box), leaving a tiny space in between. To help them adhere better, insert a small piece of uncooked spaghetti into the back of each paw, and gently push them into the rice like you would a pushpin. Optional: Using tweezers, place the candy corn in between Pusheen’s paws, so it looks like she’s holding it. 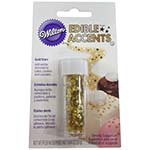 Optional: Using tweezers, apply edible gold stars randomly atop the the witch hat. If you want the nori facial features to stand out more against the grey rice, then here’s the trick: using the same nori punch that you used to cut out the nori facial features, cut out the facial features again from a slice of white cheese. 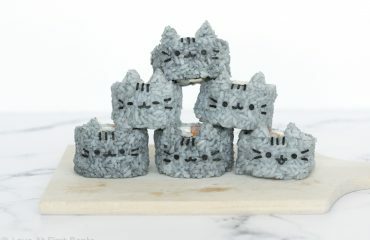 Place the nori pieces on top of the matching cheese pieces, then apply them as you normally would to Pusheen’s face. This is what I did for this bento, and what a lot of bento artists do when dealing with darker rice colors. For a visual demonstration of how to shape each individual rice component (since I think this is much more helpful than written instructions), please refer to the Witch Pusheen video tutorial. WOW!! 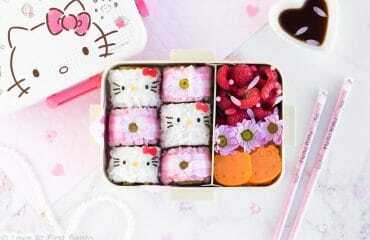 How do you keep thinking of these cute bentos??? You are so creative Shannon! Thank you so much! 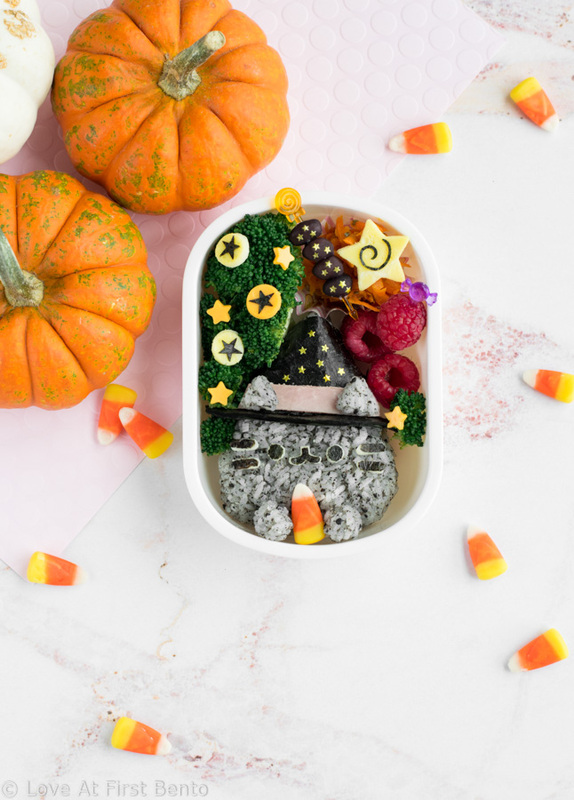 My ideas tend to come to me randomly and unexpectedly, but sometimes merchandise (like the Witch Pusheen necklace I mentioned) acts as a great source of inspiration for new bento ideas! i’m a scaredy (pusheen) cat, so cute halloween things are much more my style than scary (; and those halloween themed theme park extravaganzas are definitely not for me (the one time i went, i pooped out after 1 maze and promptly hid in the brightly lid food court). OMGAWD! This is SO cuteeeeee. Adorable!!!! So glad I popped by and saw this. Smiling for the rest of the day now. This is absolutely adorable! 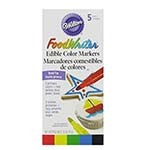 I can’t wait to pin it to share – just too darn cute! 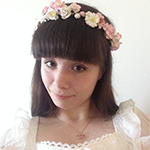 You have some serious creativity going here – your blog is a delight! Your comment and support just totally made my week Shelley – thank you SO much! So glad you liked Witch Pusheen too 😀 Hope to see you around! OMG!!!! 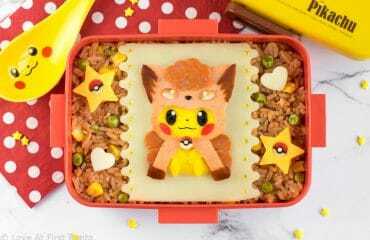 You are indeed a bento artist!! 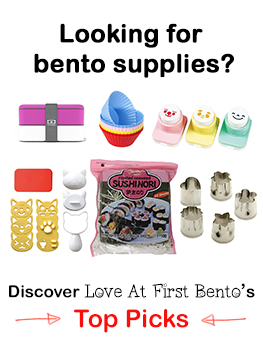 Love all you bento collection! I’m a big fan of bento myself but horrible at making it ha..ha…!! So glad to have discovered your cute creations!!!! 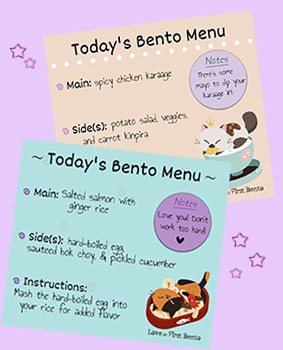 Thank you so much for your sweet comment Marvellina – I’m so happy you like my bentos! 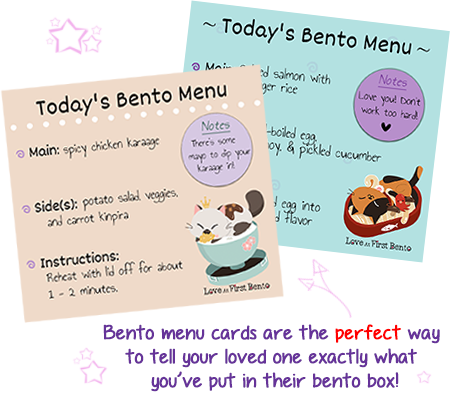 <3 There's definitely a bit of a learning curve when it comes to first making bentos, but hopefully some of my recipes and tips will help you out 😉 Hope to see you around, and thanks again for stopping by and taking the time to comment!